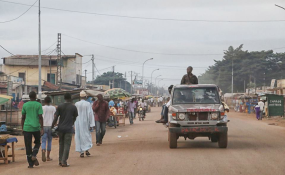 The Central African Republic, CAR, has since 2013 been embroiled in a war that has seen the displacement of tens of thousands of people both within and outside the country. Amongst the people hardest hit by the conflict are about 500,000 children, who have had to abandon school. It is in a bid to mitigate the situation that the government, the United Nations Children's Fund, UNICEF, and other partners on February 27, 2019 in the CAR capital, Bangui, launched a project to bring 900,000 children back to school, Radio Ndeke Luka reported. "Most teachers in the hinterland have abandoned their stations because of the crisis and non-payment of their salaries. This has led to a situation whereby the school system now depends on untrained Parent Teacher Association, PTA teachers," explained Christine Muhigana, UNICEF Representative for CAR. "Education will ensure peace, security and the economic development of Central Africans," noted Aboubakar Moukadas-Noure, the Minister of Education. The "Education Cannot Wait" programme has so far mobilised 6.5 million US dollars (3.7 billion FCFA) out of a total budget of 77 million US dollars (44.4 billion FCFA). 1,000 classrooms will be constructed and 320,000 school kits distributed to students in six prefectures. The programme also entails the recruitment of qualified teachers, offer of secure learning environment, stationery, school meals, pyscho-social counselling and other services for children. According to UNICEF, 89 attacks on schools have been reported since 2017, while 20 per cent of schools in the country remain closed. "Education Cannot Wait" will be implemented in six of the Central African Republic's 16 prefectures. It will be implemented by UNICEF, Plan International, the United Nations High Commission for Refugees, UNHCR and the Norwegian Refugee Council, NRC.